Established by eight Université PSL’s institutions (Chimie ParisTech, École normale supérieure, ESPCI Paris, Institut Curie, MINES ParisTech, Paris-Dauphine, Observatoire de Paris, ENSAD) that rank among France’s top institutions for scientific research and engineering, the Institute of Technology and Innovation (PSL-ITI) offers selective, multidisciplinary training for students at the post-master’s (or pre-doctoral) level or as part of a dual curriculum during doctoral study. The purpose of this research-based program is to train a new generation of exceptionally high-level engineers, researchers, PhDs and entrepreneurs who are open to multidisciplinary study, innovation and entrepreneurship. 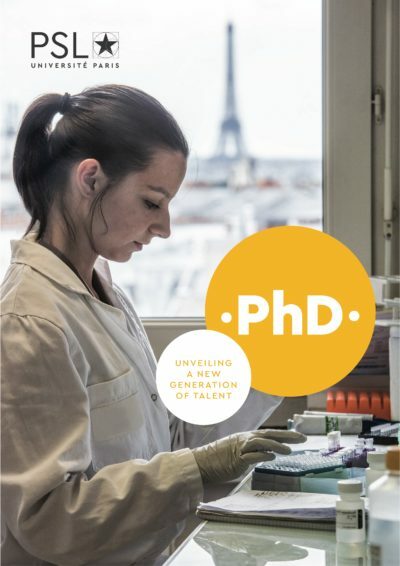 A one-of-a-kind curriculum that draws on the diversity and academic excellence of France’s leading institutions in both the hard sciences and social sciences. An innovative curriculum designed to promote the emergence of new ideas and disruptive technologies. Students gain academic knowledge in a variety of disciplines as well as solid expertise in all aspects of innovation, entrepreneurship and design. Conferences led by renowned entrepreneurs, specialized coursework in the innovation economy, coaching by professionals (investors, venture capitalists, etc. ), along with access to the PSL ecosystem (incubators, fablabs, coworking spaces). A true springboard for a career as a researcher or entrepreneur, PSL-ITI offers a wealth of opportunities: students may go on to obtain a PhD, establish a technological startup, join an R&D facility as a researcher, etc. Upon completing the course of study, students are awarded a PSL diploma (post-master). PSL-ITI is seeking applicants who are curious, inventive and entrepreneurial. Each year’s class includes a host of talented participants with a wide range of backgrounds, academic paths and career plans. During the year prior to beginning a doctoral program or during a preparatory year for an entrepreneurial project in technology, immediately upon completing a Master’s degree. or during a gap year. Post-doctoral students or experienced professionals may also enroll in the program.